Home / Film / Jurassic World: Your boyfriend’s a badass! 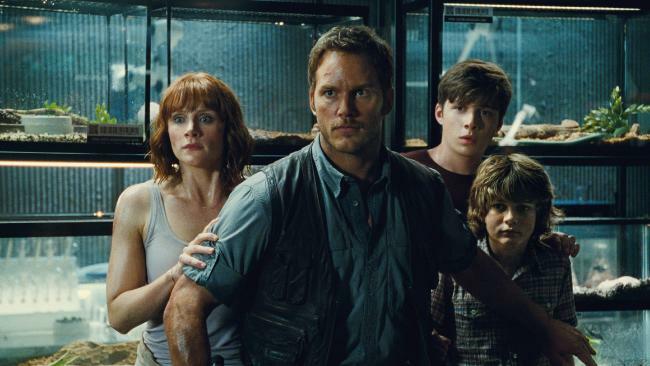 I am fed up with Hollywood churning out remakes and sequels of well-known franchises and previous hit films (and some flops even), but the latest incarnation of the Jurassic Park franchise, Jurassic World, has proved some of these franchises still have legs. Seeing Chris Pratt in another Blockbuster role is enough to get anyone to the cinema, even if the previous sequels absolutely sucked. Who doesn’t love a bit of Chris Pratt? The man has so much charisma – whether he’s playing a space rogue or a sweet, dumb shoe shiner – he lights up the screen. 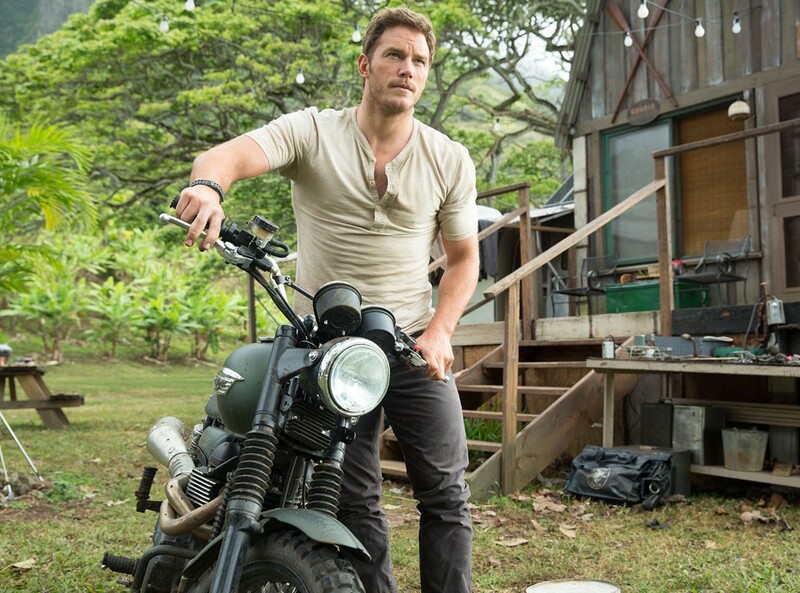 And honestly, if Jurassic World had featured anyone other than Chris Pratt I’m not sure it would have managed to pull off as much as it did. 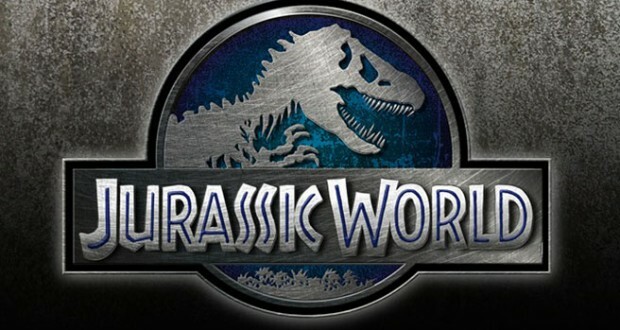 Jurassic World differs in tone from previous incarnations of the franchise – shifting from straight up drama/thriller to inject a bit of humour into the mix (and more than just the sarcastic tongue of Dr Malcolm, aka the brilliant Jeff Goldblum) – a change that is very welcome. The film tries to do an awful lot in its 124 minute run time, and this is where it trips up the most. Instead of having a clear objective, an obvious ‘baddie’, and a single philosophical focus, it shifts throughout. The dinosaurs get more focus than they did in the original at the expense of well-defined characters. 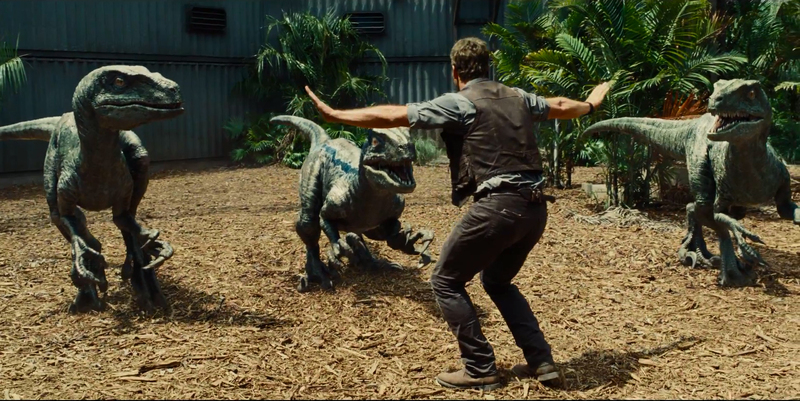 Despite its flaw, Jurassic World still manages to be a great deal of fun with some awesome dinosaur fight scenes. This is what Blockbuster films should be: fun, over the top, and with very fast paced action. 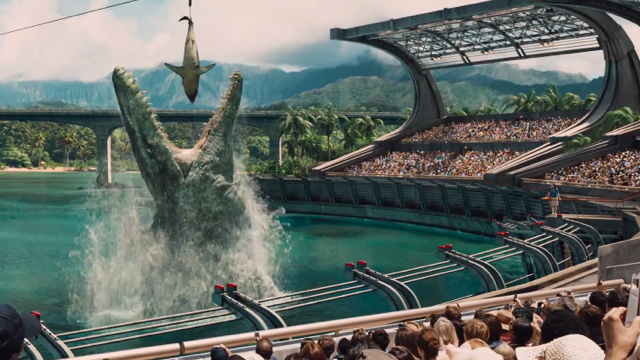 Last year’s Godzilla wishes it could be Jurassic World. 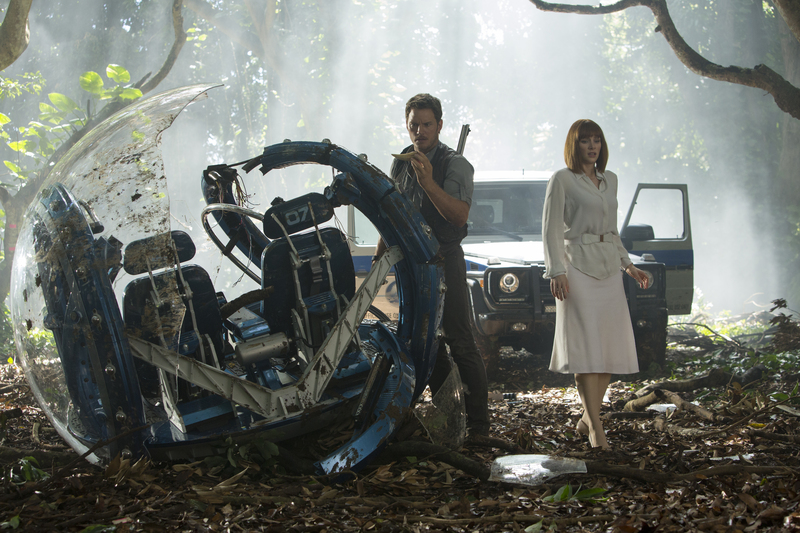 Claire (Bryce Dallas Howard), manager of the Jurassic World theme park, is having a busy day. Her two nephews, Zach and Gray, arrive on the island on the day Claire is trying to secure sponsorship for the park’s latest attraction. Kids these days are so desensitized, dinosaurs no longer impress them – so the scientists have created a genetic hybrid (a new dinosaur!) that’s bigger, smarter, and scarier. That should keep the crowds flocking to the island! Claire enlists the help of security advisor and raptor wrangler Owen (Chris Pratt) to sign off on the new attraction’s enclosure. However, in the final stages of checking the security measures are sufficient, the beast gets loose. Claire and Owen must venture out into the park to find Claire’s nephews who were out on a ride when the park went on lock down. Matters are made worse when Hoskins (Vincent D’Onofrio), a private military contractor, is determined to test the ‘trained’ raptors against the new hybrid. How will any of them make it out alive? When you come to a sequel in a major franchise, how do you up the wow factor? If you keep the story relatively within the bounds of the original(s), how do you make it something the audience hasn’t seen before? In a way, the hybrid dinosaur is more than just an added wow factor for the fictional park attendees but also the film’s audience. Other than that, the film throws threats at the audience willy-nilly to try to keep the wow factor alive. The obvious threat is the dinosaurs, but there’s also the military contractors, the human inability to control nature, and a conspiracy to boot. The action and threat levels are so high throughout, at any point where the film might dip, the filmmakers simply add another potential threat. The trouble with this approach to narrative is that none of the threats get adequate fleshing out. Even the hybrid itself doesn’t get much screen time. We’re told that she’s particularly smart – for some reason – but never given any real answers as to why she’s better than any of the other dinosaurs. This is especially questionable when Dr Wu points out that they haven’t done anything that unusual – they have always filled in holes in the ancient DNA with info from other animal species. Beyond the standard cliché of military men wanting to turn everything into a weapon, we don’t get a sense of why Hoskins and the other PCM’s want to manipulate proceedings the way they do. And other than tenuous links to an overall philosophical concern with humanity’s tendency towards excess, these threats pile up to leave us with a rather disjointed, over-complicated narrative. Let’s face it, films like this aren’t about deep characters or accurate science – they’re about the action. And Jurassic World is all action from start to finish. It’s so fast-paced, while you’re in the cinema you won’t have time to stop and think about any plot/science/character holes. As such, the film is thoroughly entertaining. It’s tense, thrilling, and terrifying. The cast is what really holds the film together. Bryce Dallas Howard actually manages to summon up an inkling of personality (it’s the first I’ve ever seen from her) and Chris Pratt has more charisma in his pinky than most film stars manage in their entire existence. I do have a bone to pick about Claire’s character though. Not that it is an issue unique to Jurassic World, but why oh why do films like these have female characters that run from danger while wearing high heels? 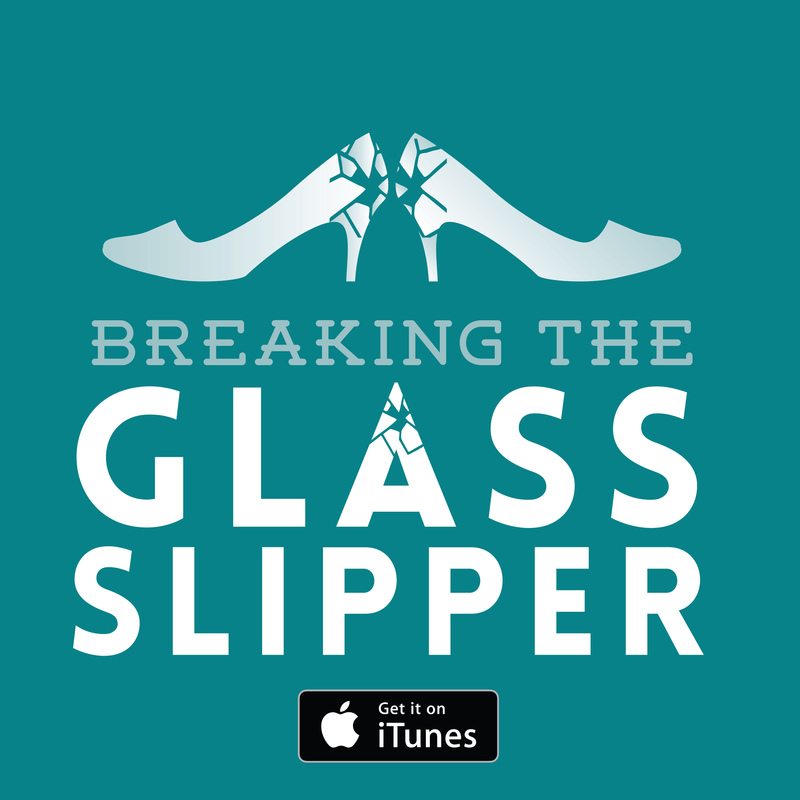 Claire keeps her heels on while running from a T-Rex – I mean, come on, as if. No woman with even half a brain would be so dumb. And why is it that working women can only look ‘good’ if we’re wearing heels. Can we please get over this gender stereotyping already? The only superfluous aspect of the cast – and story – is the kids. I understand that they work as a catalyst to get Claire out into the field rather than just evacuating with the park’s visitors, but their plot is not very interesting (and this could have been done in other ways). We get plenty of a sense of wonder without seeing the world through a child’s eyes – and honestly, who cares about young kids worrying about their parents getting a divorce (or am I too heartless?!). With supporting performances from Omar Sy, Vincent D’Onofrio, Jake Johnson, Irrfan Khan, and BD Wong, the film lifts potentially rubbish material into something almost believable, with plenty of comedy and conspiracy to keep us hooked. Verdict: Great fun. You’ll be on the edge of your seat throughout, with lots of action and great CG dinosaur sequences. But don’t go to Jurassic World for character, sensible plot, or any kind of realism (though this could be said of almost any Hollywood Blockbuster). Passengers: Stand-alone scifi film confirmed by Sony The Magnificent Seven: A clichéd Hollywood remake The Lego Movie: All I’m asking for is total perfection Edge of Tomorrow: Live. Die. Repeat.